Assange Exposes The Truth About Corporate Media: "You Are Reading Weaponized Text"
Of course, no coincidence exists in the corporate press’ continued stark criticism of WikiLeaks as a politically-motivated organization — an allegation oft-repeated during the last presidential election cycle. We had lots of critics in the Democratic Party, liars in the Democratic Party … saying that what we published was not accurate — trying to imitate it, sometimes saying it directly. And of course, we could mathematically prove that they were liars. And it’s not every day that you can mathematically prove that your critics are full of it. We try and maximize the value of the information to readers. So that’s publishing it at the moment when they most want to read it, when they most want to know what it contains. And that’s definitely before an election rather than after election. I think that is the real beauty of WikiLeaks … it is that sea of information, that treasure, that intellectual treasure, that rebel library of Alexandria you can go into. 7 Comments on "Assange Exposes The Truth About Corporate Media: “You Are Reading Weaponized Text”"
Still can’t decide – is he real or is he there to distract ? he says he is annoyed by anyone who questions the official account of 9/11. and you can’t decide if he is real? 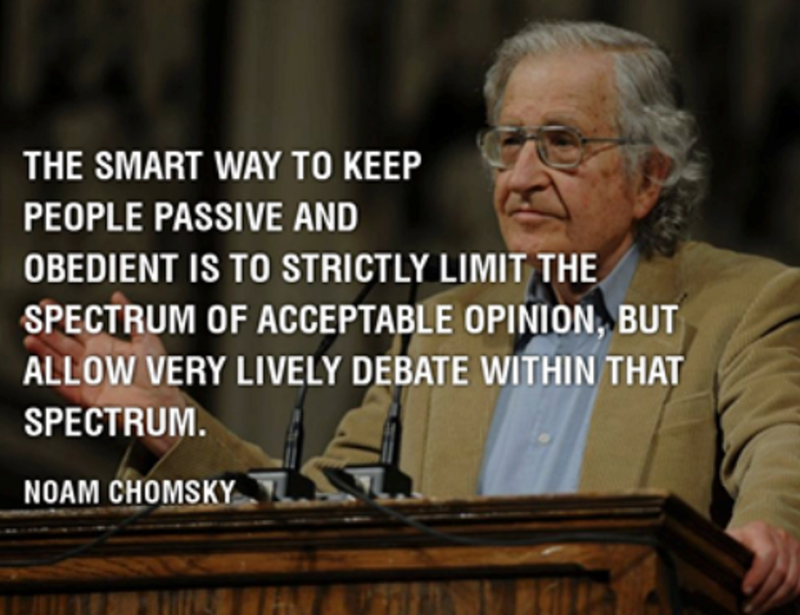 as for chumpsky.. the epitome of a gatekeeper..
Then it should be clear……. President Trump also said that there should be a real investigation into 9/11. But at this time there is only two things that he has not done constitutionally as per his contract since taking office that I know of – sorry, three… But since the CIA/FBI and other alphabet “intelligence” agencies, plus the Military Industrial Complex, add in the Federal Reserve/banking are fighting to remove him I can understand why. If you want a lawful President, lawful legislative, lawful judicial first read the US Constitution so that you know exactly what they are allowed to do – and if it is not assigned to them it is forbidden to them; what they may not do as our representatives and as the representatives of the states in dealing with mostly foreign affairs. But understand that the delegated powers are not given to any person, but are instead assigned to the branch of government or to a named office within a branch. The person serving is allowed to use the authority of that branch or office for as long as they keep to the contract, take and keep their Oath. 3) the US Constitution, with it being also the definer of our governments – state and federal; the supreme LAW of our land that requires that ALL legislation be in Pursuance thereof it (follow it). — As stated in the 10th Amendment, all others powers are reserved by the States OR The People…. If it is not in the US Constitution then it is a duty of the states or of the people themselves. Yes, the people did NOT delegate all their authority. So what duties are the peoples per the US Constitution? This protected the people from “martial law” and “emergency powers”, from traitors and domestic enemies serving within our governments, and from police states because every able-bodied person is trained as the congress requires the military to be trained and educated in the US Constitution and the Constitution of their state. Cannot enforce them if you do not know them. The duties that those that serve within the state and federal governments have to the Militias is found in Clause 16. Authority of training the Militia according to the discipline prescribed by Congress”. One must understand that ONLY those that serve within the Congress can call up the military and the Militia. The Military when, and only when, the Congress issues a declaration of war. The Militia is required to be used to enforce the laws of our land – by that requirement those that serve within our governments – state and federal – are forbidden to use any other agency or group, etc for those purposes. This protects the people from those unlawful enforcement groups they have created when they worked so hard to stop the people from doing their own constitutional duty. The Grand Jury and Grand Jury Investigations are tools of the people to use to keep those who serve within our governments in check. We are required to be INFORMED jurors. What does that mean? We need to know the supreme Law of the land, and the highest Law of our state. How else can we hold accountable the people who serve within our governments? How else can we be sure that the people who are dependent on an informed jury gets a fair trial? How, if we did not know, can we make a decision that the law is a bad one and must not be enforced; or that in this particular case the law must be ignored (some starving steals an apple) though retribution can still be rendered (work for free for a time to pay off the theft of the apple). How can we know if a judge is using the required “good Behaviour” while serving if we do not know the standards for good behavior – do the duties as assigned by the US Constitution/state Constitution, take and KEEP the Oath of Office. Excellent, well done. I hope people will read it because solutions come from knowledge and wisdom. Regrettably knowledge only prepares us for the fight. When those in government do not follow their own rules, much less the ones written to restrain them (Constitutions) it does no good to try to hold them to it when they control the goons with guns. The tyrants must be removed, one way or another, there is no other solution. Somebody please leak Trump’s tax returns to Wiki…. Go Assange. When the Left despises you, you must be doing something right.